In this bento: leftover chicken stirfry, rice, Arkansas Black apple slices from Walker Apples, baby carrots, slices of cucumber, and two mini pork buns. I tried steaming the pork buns in my microwave steamer and I think I overdid it. I will have to resort back to the stovetop method. They are tasty though! I picked them up at Asia Mart in Santa Rosa. Big News! My little brother and his beautiful wife had their first baby yesterday. She's tiny, just 6 pounds 2 ounces, and her name is Molly Ruby. I can't wait to head to Seattle at the end of this month to meet her. You can call me "Auntie M" from now on. 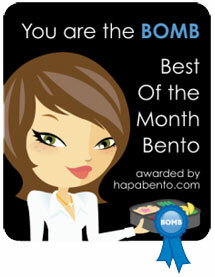 :-) I'll have to come up with a fun bento to celebrate her birth! Aw, Molly Ruby is a darling name! Isn't it the greatest name?! I am so in love with her already. 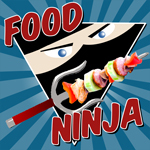 What did you get from the Food Ninja contest, sheri? Mine was the Manpans. Ooh, I love cha siu baos! 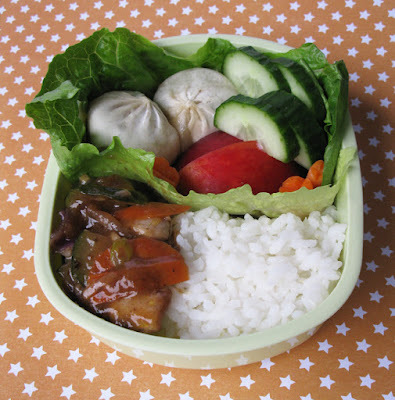 (The steamed buns.) I microwave them in a regular bowl with a wet paper towel on top; keeps them from drying out and getting chewy. I discovered them many years ago at a place in L.A. called Fuk Man Lo. (Yes, it's pronounced just the way you think it is!) They had the most gigantic cha siu baos stuffed with chicken or pork for 60-cents each! I used to buy as many as I could cram in my freezer, then take them out one at a time over the next month. "Aunty Em! Aunty Em! Where are you Aunty Em!" (followed by wicked witch cackle). That can be little Molly's running gag for the rest of your life. Thanks dragonmamma! I was thrilled to find these little mini bao versions at Asia Mart. I just have to get the right method of nuking them for bentos. And I already have visions of Molly in ruby red slippers, running after me and yelling "Auntie M!" :) Where does one find baby sized ruby red slippers? Congrats being an aunty! I normally wrap the char siu baos in a wet paper towel before putting it in the microwave, just keep the paper towel moist and that should eliminate the over dry-ness. Oh I didn't know you have to use dashi to make miso soup?! Have you tried the instant miso soup from Trader Joe's? They're pretty darn good!! Thanks Mrs. P! I'll try that tip the next time I heat up the char siu baos. I found some dashi granules at Asia Mart and they work great. It really does make a difference to get that authentic flavor.